See River Torrens with its delightful garden banks, Parliament House, State Library, Trinity Church (Adelaide's oldest church), fashionable Hutt Street and stop at Haigh's Chocolates to enjoy complimentary tea or coffee accompanied by fine Haigh's chocolates (Haigh's unavailable on Sundays. See Beehive Corner at Rundle Mall, Adelaide Oval (one of Australia's most notable cricket grounds and houses the Bradman collection), the quaint suburbs of North Adelaide; O'Connell Street (restaurants and trendy shops), St Peter's Cathedral, Colonel Light's Lookout on Montefiore Hill (spectacular views over Adelaide). Spend the days exploring Adelaide at your own leisure. Cruise from Adelaide to Fremantle aboard the luxurious Vasco da Gama ocean liner via the remarkable Great Australian Bight. Enjoy the traditional and stylish cruising experience featuring an endless array of activities and a great selection of impressive entertainment options. You have ports of call in Esperance and Albany; along with a visit to Busselton in the Margaret River Region anchored in spectacular Geographe Bay. Choose from a range of optional excursions in Albany and Esperance or wonder around the towns to explore yourself. Enjoy the on board entertainment and day time activities of the Vasco da Gama. The Vasco da Gama’s attentive staff will ensure your every need is taken care of on this westerly voyage to cosmopolitan Fremantle. 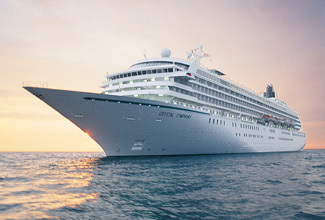 Today you will be personally met at your hotel by a DISCOVER AUSTRALIA representative and transferred from your central Adelaide hotel to Port Adelaide Passenger Cruise Terminal, board the Vasco da Gama and begin your cruise West. The Great Australian Bight lies on the coast of Southern and Western Australia and is a pristine wilderness of incredible natural beauty, dramatic sea cliffs rise majestically from the ocean, an ocean that teems with an incredible wealth of marine life including great white sharks, humpback whales and sea lions. Bird life here includes the white-bellied sea eagle and albatross. Sail across one of the most remarkable "Bights" or open bays in the world aboard the Vasco da Gama. Look out for a wealth of marine and bird life while you sail this vast aquatic expanse. Esperance offers the kind of natural beauty that borders on overwhelming, and a slow simplicity that will remind you that sometimes, the Earth’s treasures are all you need. Esperance is blessed with squeaky-clean white sand and turquoise waters. The Recherche Archipelago dots the seascape as far as the eye can see, lining the Esperance coast with more than 100 smooth, rock islands that are scattered in the vibrant blue ocean. Indeed, scientific tests have ruled that Esperance has some of the world’s whitest sand. Check out the arts centre and galleries, drop into the museum to view what's left of the NASA Skylab after it slammed back down to Earth near Balladonia. The bustling seaside city of Busselton is renowned for its bays and beaches. The region’s coastline is diverse; from the long, curving, wide beaches and calm waters of to the secluded white sandy coves with rocky headlands - some regarded by many as some of Western Australia’s premier surfing beaches. Set on the edge of the Indian Ocean, this pretty city has plenty to offer - both in natural beauty and man made attractions. The world famous Busselton Jetty captures your attention and imagination and provides an exquisite backdrop to the white sandy beaches. Arrive in Busselton and choose from a range of optional shore excursions or explore Busselton on your own at your own pace. Alternatively, you can stay on board the Astor and make use of the range of facilities available. Fremantle's historic streets are abuzz with vibrant bars, cafes, restaurants and clubs, head to the famous 'Cappuccino Strip' which is the city's hub for eating and drinking, elegant streets lined with colonial architecture are home to markets and boutique shopping, historic attractions abound, picturesque Fishing Boat Harbour is a must-see. For customers travelling from Perth, the package is 17 days in duration, travelling Adelaide to Perth on the Indian Pacific and staying 3 nights more in Adelaide. You will be personally met by a DISCOVER AUSTRALIA representative and transferred from Sydney airport to the Indian Pacific railway station to begin your journey to Adelaide. On arrival in Adelaide you will be transferred to your Adelaide hotel. You will be met at your hotel by a DISCOVER AUSTRALIA representative and transferred from your hotel to the Vasco da Gama and from the Vasco da Gama to the Perth airport for your flight home. The Adelaide to Fremantle Vasco da Gama Cruise with Indian Pacific is very popular. Many dates book out well in advance, please book soon.